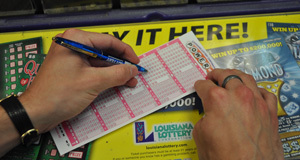 BATON ROUGE – Booking a trip to France and going on a shopping spree were just a few of the plans Louisiana Lottery players had for some of the nearly $13.6 million in scratch-off cash prizes claimed in March. The Lottery also reported more than $8.2 million won during drawings held in March. March’s draw-style game winnings included seven Powerball match-4 + PB prizes totaling $350,000 and 132 Powerball match-4 prizes totaling $13,200. There were also three Mega Millions match-4 + MB prizes totaling $30,000 and 23 Mega Millions match-4 prizes totaling $11,500. One player won a Lotto jackpot prize worth $550,000 and 91 players won Lotto match-5 prizes totaling $210,624, helping to bring Lotto’s monthly total winnings to $1,160,315. Pick 3 winning tickets totaled $2,285,580 and Pick 4 winning tickets totaled $1,776,700. Two players won Easy 5 jackpot prizes totaling $300,411, which brought the game’s monthly total winnings to $458,493 with an additional $146,136 won on ezmatch, an instant-win option available for an additional $1. “Over 62,000 Power Play purchasers won an extra $447,300 in addition to their regular Powerball prizes,” Lottery President Rose Hudson said. “More than 20,000 Megaplier purchasers won a bonus total of $150,294 in addition to their regular Mega Millions prizes.” The $1 Power Play option offers Powerball players the chance to increase any nonjackpot winnings. The $1 Megaplier add-on multiplies nonjackpot Mega Millions prizes by a multiplier number selected during the drawing. In total, draw-style game winnings from drawings held in March were $8,205,700. Lottery draw-style game players have 180 days from the date of the drawing to claim the winnings from those tickets. “We encourage players to sign the back of their tickets immediately after purchasing and to check them promptly after the drawing. Even if a ticket does not win the jackpot, it could have won another prize,” Hudson added. In addition to $13,576,811 in scratch-off cash prizes paid during March, players also claimed $2,425,156 worth of free-ticket prizes. According to Lottery policy, scratch-off games are closed when all top prizes are claimed, and scratch-off players have 90 days from the official game closure date to redeem a winning ticket. A list of current scratch-off games, prizes remaining and claim deadlines can be found on its website, www.louisianalottery.com/scratch-offs. While actual game performance and the amount of prizes claimed will vary from month to month, the Lottery allocates nearly 53.7 percent of sales to fund prizes. At least 35 percent of sales is transferred to the state treasury for the Minimum Foundation Program that funds K-12 public education in Louisiana. Retailers are paid 5.6 percent compensation, and the Lottery retains less than 6 percent of sales to operate. Hudson reminded ticket purchasers to play responsibly, encouraging anyone who has a gambling problem, or friends and family of anyone with a gambling problem, to call toll-free 1-877-770-7867 for help. Ticket purchasers must be at least 21 years of age.